Your clothes, underwear and socks are all regularly washed. But why don't we wash our shoes?! Most people wear shoes the whole day. Your feet produce about 250 ml of sweat each day. The warm, moist inside of your shoes is ideal for fungi and bacteria. Not only do they cause smelly shoes, they can also cause athlete's foot and nail fungus. The Shoefresh shoe freshener cleans and dries your shoes within half an hour. So you have no stench in the house and step into your shoes every day with a fresh feeling. Your shoes are always dry the next day, without hassle with newspapers. *Click here for the conditions. • No more smelly shoes at home. Step into your shoes with a fresh feeling. • Your shoes are always dry the next day, without hassle with newspapers. 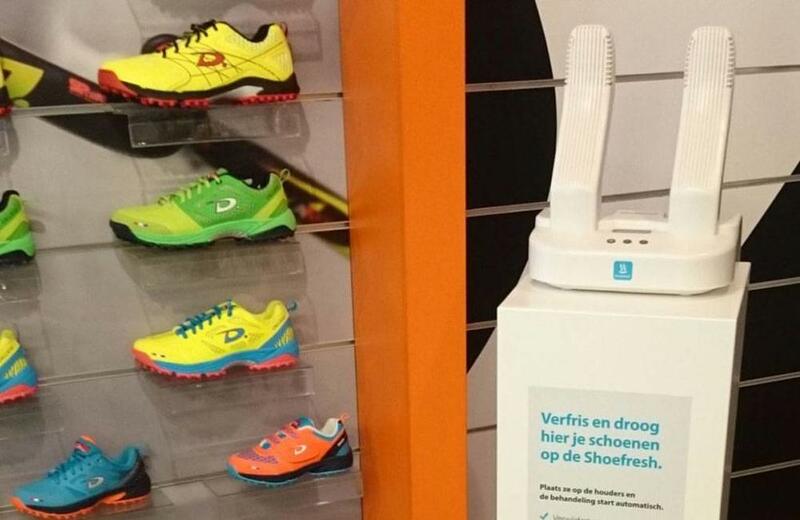 • Easy to use: put your shoes on the Shoefresh and the program starts automatically. • Suitable for all types of shoes and boots, but also shin guards, gloves and helmets. 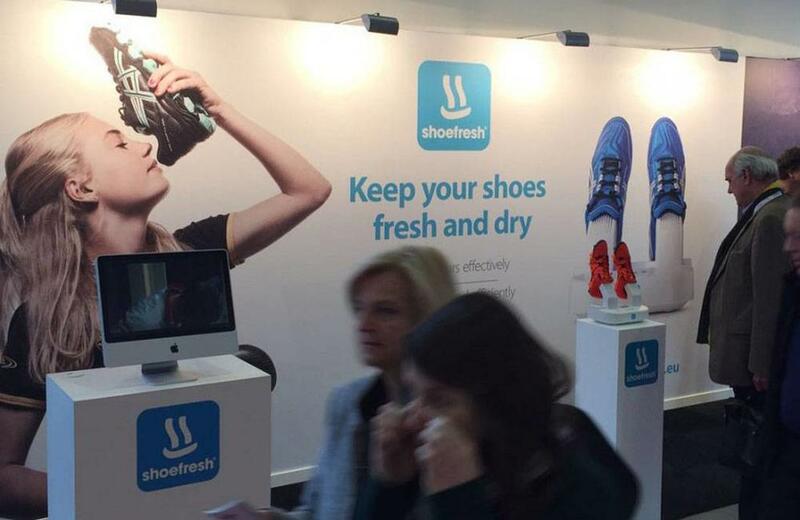 The Shoefresh is the shoe freshener that cleans and dries. All you have to do is place your shoes over the holders. The program will start and stop automatically and within half an hour your shoes are fresh and dry. The shoes are cleaned using Active Oxygen technology. 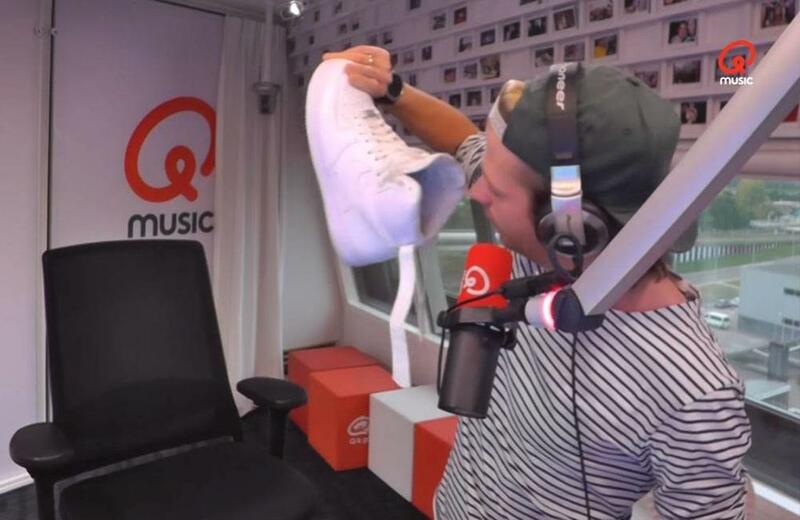 Active Oxygen (ozone) tackles the bacteria and fungi that cause smelly shoes. During the second step the shoes are dried. This happens from the inside out, which is much better for the shoes than drying them on, for example, the radiator. Using ozone, nasty odors are effectively removed. Hot air ensures that shoes are completely dry within half an hour. Blows ozone and hot air through the entire shoe, from the inside. Suitable for shoes, boots, shin pads, helmets and gloves. Place your shoes on the holders and the program starts automatically. Use the standard program or adjust the Shoefresh to your own preferred settings. It is estimated that over 30% of the population suffers from athlete’s foot or nail fungus. It is very difficult to get rid of this: there is a high chance that the infection will keep on coming back. Regularly cleaning and drying shoes can help to prevent re-contamination from your own shoes. Over 2500 podiatrists in Europe are already using the Shoefresh. The Shoefresh has become essential in the treatment of nail fungus and athlete’s foot. My children often come home from their training of match with wet, smelly shoes and shin pads. I used to put them under the heater in the scullery, or outside so that the bad smell doesn't spread in my house. My children train 3 times a week and it is almost impossible to get their shoes dry again. I was really relieved when I discovered the Shoefresh. After every training or match my children now put their shoes on the Shoefresh. This way they are dry and odorless in time before the next training. For years I've been struggling with foot problems: sweaty feet, smelly shoes, athlete's foot, fail fungus etc. As a military man you wear the same shoes all day long. Even after our training we have to continue working in the same sweaty, moist shoes. The Shoefresh is excellent. While I'm taking a shower I put my shoes on the device and half an hour later they are fresh and dry. It feels great to put them back on again on continue my working day. With frequent use I noticed that the smell of my shoes decreased greatly. I also use the Shoefresh for my regular shoes and sports shoes. After a treatment the smell is completely gone. The effect of the Shoefresh really is fantastic. Both the cleaning and drying of the shoes work great. We put the Shoefresh in a fixed place in our pantry, near the two shoe racks. As soon as we take off our shoes, we place them on the Shoefresh. This has become a automatic routine. For my active family the Shoefresh is perfect. We use it for football shoes, shin pads, running shoes, sneakers and even work boots.